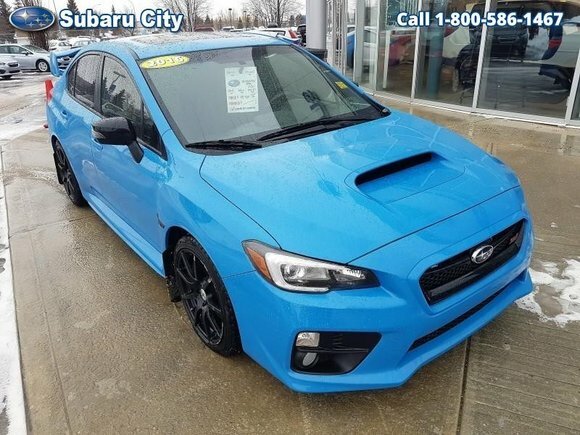 Home > Used Vehicles > 2016 Subaru WRX STI STI,AWD,SPECIAL HIKARI EDITION,LEATHER,SUNROOF,AIR,TILT,CRUISE,PW,PL,CARPROOF IS CLEAN,MUST SEE!!!! 2016 Subaru WRX STI STI,AWD,SPECIAL HIKARI EDITION,LEATHER,SUNROOF,AIR,TILT,CRUISE,PW,PL,CARPROOF IS CLEAN,MUST SEE!!!! On Sale! Save $1054 on this one, we've marked it down from $40900. This 2016 Subaru WRX STI is for sale today in Edmonton. Unflinching all-road performance and an unabashed design express the uncompromising soul of this Subaru WRX STI, a real-world sports car as forceful as its presence. An even hotter version of the WRX, this WRX STI pushes the limit of performance even further. This is intensity at its peak and performance at its apex. It’s a commuter, an errand-runner, and a track-day weapon, all rolled into one. Born from rally racing, this Subaru WRX STI blends everyday practicality with a thrilling driving experience like nothing else. This sedan has 49235 kms. It's blue in colour and is completely accident free based on the CARFAX Report. It has a manual transmission and is powered by a 2.5L H4 16V MPFI DOHC Turbo engine. It has some remaining factory warranty for added peace of mind. Buy this vehicle now for the lowest bi-weekly payment of $258.55 with $4267 down for 84 months @ 5.99% APR O.A.C. ( taxes included, $790 Administration and Secure Ride included / Total cost of borrowing $8655 ). See dealer for details. Want to try the 2016 Subaru WRX STI STI?